In Mahayana Buddhism, according to the doctrine of trikaya a Buddha has three bodies, called the dharmakaya, sambhogakaya, and nirmanakaya. Very simply, the dharmakaya is the body of the absolute, beyond existence and non-existence. The nirmanakaya is the physical body that lives and dies; the historical Buddha was a nirmanakaya buddha. And the sambhogakaya might be thought of as an interface between the other two bodies. Sambhogakaya is the body of enjoyment or the body that experiences the fruits of Buddhist practice and the bliss of enlightenment. Some teachers compare dharmakaya to vapor or atmosphere, sambhogakaya to clouds, and nirmanakaya to rain. Clouds are a manifestation of atmosphere that enables rain. Buddhas depicted as idealized, transcendent beings in Mahayana art are nearly always sambhogakaya buddhas. The nirmanakaya body is an earthly body that lives and dies, and the dharmakaya body is formless and without distinction -- nothing to see. 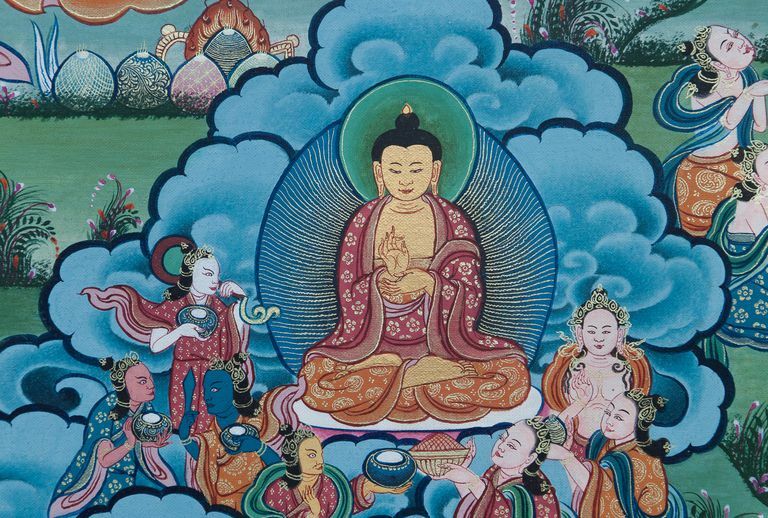 A sambhogakaya buddha is enlightened and purified of defilements, yet he remains distinctive. Amitabha Buddha is a sambhogakaya buddha, for example. Vairocana is the Buddha who represents the dharmakaya, but when he appears in a distinctive form he is a sambhogakaya buddha. Many of the Buddhas mentioned in Mahayana Sutras are sambhogakaya buddhas. When the Lotus Sutra cites "the Buddha," for example, it is referring to the sambhogakaya form of Shakyamuni Buddha, the Buddha of the present age. We know this from the description in the first chapter of the Lotus Sutra. "From the tuft of white hair between his eyebrows, one of his characteristic features, the Buddha emitted a beam of light, illuminating eighteen thousand worlds in the east, so that there was nowhere that it did not reach, down to the lowest purgatory and up to Akanishtha, the highest heaven." "It is said that the Sambhogakaya manifests not in any kind of spatial or physical location but in a place that is not really a place; a place of nowhere called Akanishtha, or wok ngun in Tibetan. Wok mi means "not underneath," suggesting that Akanishtha, because it is a field of nowhere, is all encompassing. Ultimately wok-ngun refers to emptiness, or sunyata." Are these Buddhas "real"? From most Mahayana perspectives, only the dharmakaya body is entirely "real." The samghogakaya and nirmanakaya bodies are just appearances or emanations of the dharmakaya. Possibly because they manifest in Pure Lands, sambhogakaya buddhas are described as preaching the dharma to other celestial beings. Their subtle form appears only to those ready to see it. In Tibetan tantra, sambhogakaya is also the speech of a Buddha or the manifestation of the Buddha in sound.